KEN GIGLIOTTI / WINNIPEG FREE PRESS. Rev. Marcos Farag of Winnipeg's St. Mark Coptic Orthodox Church is looking forward to the visit of Pope Tawadros II, the spiritual leader of the Coptic church. The pope is coming to Winnipeg this fall. But before you get too excited, it’s not Pope Francis of the Roman Catholic Church. It’s that other pope. On Sept. 19, His Holiness Pope Tawadros II of the Coptic Orthodox Church of Alexandria visits Winnipeg for a few hours as part of his month-long cross-country tour of Canada. “He cares about everyone and this congregation and we are important to him,” says Rev. 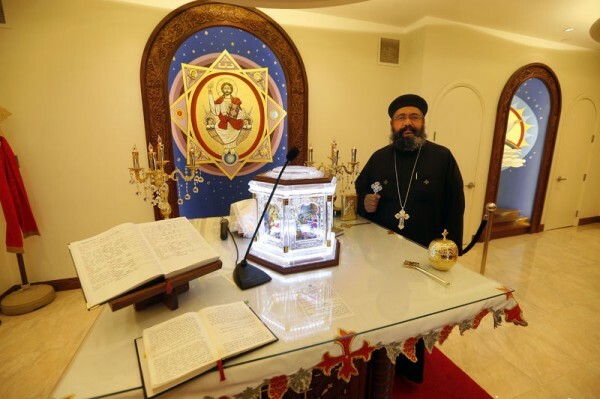 Marcos Farag, priest of St. Mark Coptic Orthodox Church in Winnipeg. This is the first visit to Canada for Pope Tawadros, a former pharmacist turned monk, who became head of the Cairo-based church on Nov. 19, 2012. Former Pope Shenouda III had planned to visit Winnipeg about five years ago, but cancelled due to ill health. He died in 2012. Canada is home to about 50,000 Coptic Orthodox Christians. About 250 families are part of St. Mark, the only Coptic Orthodox parish in Manitoba. Pope Tawadros’s three-and-a-half hour visit to St. Mark includes meeting parishioners and as many local dignitaries, politicians and church leaders who are able to attend, says Farag. That willingness to meet and talk with people is a major theme of the pope’s month-long visit, says Rev. Angelos Saad, priest of the Coptic Orthodox Church of the Virgin Mary and St. Athanasius in Mississauga, Ont. “Everyone can talk to him, see him, meet him,” explains Saad in a telephone conversation. Winnipeg organizers are planning a meal for the pope, as well as requesting their spiritual leader lay the cornerstone of for a new Coptic worship centre still in the planning stages, says Farag. The people of St. Mark worship in a large conference room at their sprawling campus at 1111 Chevrier Blvd., formerly home to Trinity Television. The congregation plans to build a Coptic-style church seating 1,100 on the parking lot just west of their current building. Designs are still in progress, and the congregation need to raise at least part of the estimated $10-million cost before proceeding, says Farag. He says the proposed building will be a visible presence for Coptic Orthodox Christians in Winnipeg, with its domes, icons, carvings and a bell tower up to 30 metres high. “We want to be a landmark for the Coptic Church,” explains the Egyptian-born Farag, priest at St. Mark for the last decade. The title of pope may be confusing for those outside the Catholic or Orthodox faith, says Metropolitan Archbishop Lawrence Huculak of the Ukrainian Catholic Church in Canada, part of the larger Catholic Church. The heads of many Orthodox and Eastern Rite churches are called patriarchs, a title the Coptic pope also carries. “A partial explanation is it’s just an issue of language or linguistics,” Huculak says of the title of pope, based on the Latin word for father. The last — and only time — the Catholic pope visited Winnipeg was on Sept. 16, 1984, when Pope John Paul II rode down Portage Avenue in his popemobile. He visited two of the city’s Catholic cathedrals and gave the homily at a mass at Bird’s Hill Park.